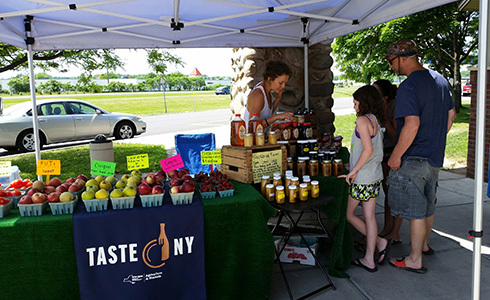 For almost 20 years, the Thruway Authority and New York State Department of Agriculture and Markets have partnered to give travelers the chance to sample some of the finest locally grown produce that New York's farms have to offer. Everything from fresh fruits and vegetables to edible herbs and horticultural products can be found at a Taste NY Farm Markets. Only produce grown or produced in New York State may be sold. The table below provides a list of participating farms, their products, location, and hours of operation. Market days and hours of operation are dependent on product availability and weather.